1. Bed bugs – the ultimate backpacker’s nightmare. After years of staying in hostels and playing bed roulette, the little beasts finally got me in Kuala Lumpur. I was covered in bites from my ankles to my thighs, and the nocturnal cretins had a particular fondness for the backs of my knees. A pair of Jeanie pants and antibiotic cream sorted me out, although the red welts took a week to disappear completely. Bed bugs are a common topic of conversation when you venture abroad, and you may encounter some unlucky victim who stayed in the same 10-bed dorm as you. The reality is that anyone can carry bed bugs to any new place – beds in a posh London hotel are just as likely to be infected as a bedsit in Istanbul. To prevent the spread, most hostels will not permit sleeping bags on their beds, and if you’re attacked you should report it so they can fumigate the room. 2. 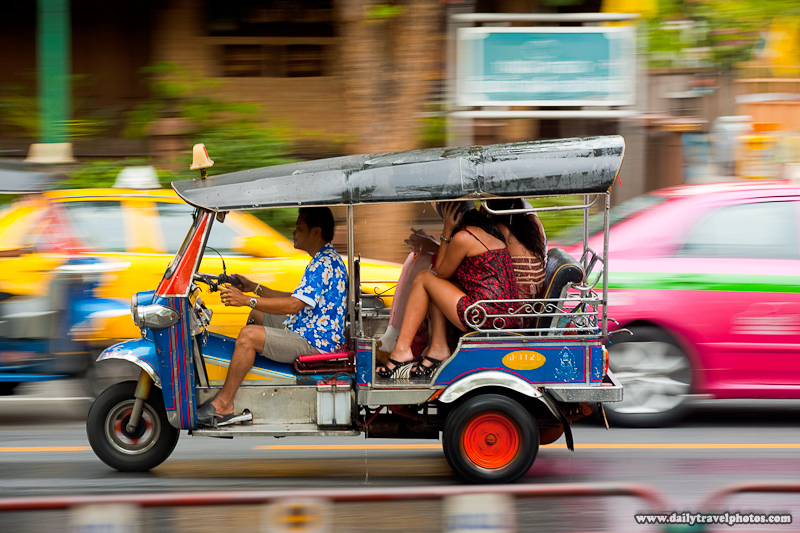 Driving mishaps – the tuk tuk edition. Now I’m a big fan of those cute painted tin cans on wheels. However, I’m not so fond of some of their drivers. From one drunk man who couldn’t quite remember his way around Bangkok, to a cheeky driver who had an impossible number of cousins that all wanted to sell us something. That said, I can’t help but admire the driver’s bravery when their little spluttering engine come up against hulking great lorries, and they confidently cut in front despite not being able to accelerate past 30mph. Watching everyone swerve within inches of you makes it feel like you’re in a video game rather than reality. Even when the inevitable hit of a motorbike happens, there is no animosity, only laughter. But this is once you become desensitised to it all. The first few times where your luggage threatens to topple the tuk tuk at every corner can be terrifying! 3. Lurgies – the inconvenience of being ill. I caught a sickness bug whilst scuba diving in Koh Tao, along with the rest of my team. It was karma really – I had teased my sister for drinking one too many cocktails the night before and gave her no sympathy. The vomiting virus made for some very unpleasant boat rides to our diving sites, and trying to do buddy checks whilst strapped to a heavy oxygen tank and swaying on deck wasn’t too fun. Keeping hydrated and healthy is vital for a good dive, but we were so desperate to complete our course we sluggishly powered through. Actually, once you were under the waves, the nausea disappeared. I only had one underwater incident where I created an imaginative Charades gesture for “I’m going to vom!” Back on the boat, our instructor told us that being sick is possible through your regulator (just in case you were wondering…), and better still, the fish love it! 4. Border crossing – the night bus from hell. The driver’s assistant shooed us from the comfy lower seats that we’d made home in, and waved all the tourists to the back of the bus. The 5ft seats that were in a permanent recline position across the back had another five seats jammed behind, which you could only reach by climbing over the first lot. Underneath us were five seats for more unfortunate tourists. We were jammed up against the dripping air con panel and our bags were squished between bent legs. We were quickly acquainted with our fellow passengers, who shared our grumbles at the coffin-like seats and the lack of an emergency door. To top it off this was our longest bus ride at 22hrs and the driver had just started playing a hideously high-pitched Korean panto on the tv. The 6am crossing into Vietnam was no better – in a monsoon outpour we had to carry our rucksacks across no-man’s land to the next immigration window, where giant butterflies hopelessly flapped around in what could only be described as a moth mausoleum, decorated with dusty wings and angry officials. 5. Driving mishaps – the moped edition. As someone who has never driven a moped/motorbike in my life, except in GTA, I was amazed at how easy it was to hire a moped in Thailand. No driving licence necessary, no previous experience and even the helmet was not compulsory (of course I took one, remembering my head teachers’s infamous cracked egg assembly). It didn’t start well – my boyfriend’s bike immediately ran out of fuel at the worst possible time. After filling up a Fanta bottle, we then had to drive the wrong way up a motorway. Then, I stupidly managed to lodge my hand between the accelerator and wing mirror, sending me buckaroo-ing across a garage forecourt (read the whole story here). The hardest thing was forgetting everything you already know about driving – weaving across and instinctively dodging traffic suddenly made perfect sense. Anyone who’s been to SE Asia will know how important two wheels are, and I’ve been told that a Vietnamese man without a motorbike has no chance of finding love! 6. Pickpockets – the cost of travelling with technology. We met so many backpackers with tales of woe where their laptops or phones were nicked (see my post on what not to pack here). We were relatively lucky – despite being a walking Apple advert we did not fall prey to any thieves. However, the cleaning lady did stand on Tom’s laptop, cracking his screen, and during a torrential downpour we found Tom’s phone lying face down in a newly formed river after a quick visit to a local waterfall. It’s best not to tempt fate – I felt constantly paranoid that I’d be targeted and next time I’d prefer not to have so much to lose. Make sure you get everything insured before leaving for your trip- many insurers won’t help you if you’re out of the country. Some specialist insurers might give you better cover on your travels, such as WorldNomads. What travel blunders have you kept shtum? Next Post Would you give away your DNA? Haha! Yes it’s best to make friends with them I think because they’re everywhere – did you know they can fly?! I had the opportunity to eat one in Thailand, but I opted for a cricket and scorpion instead (none of which I’d advise eating).